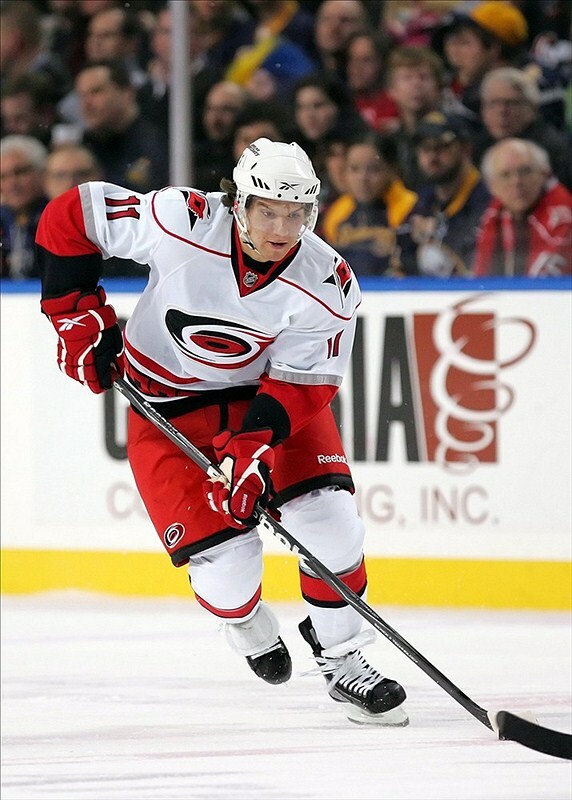 Jordan Staal will be out for 3-4 months, and it is questionable on how well he will play when he returns. All off-season long the discussion has been that the Hurricanes need veteran players to step up and take control of the team. The Hurricanes are in one of the toughest divisions in the league, and they lack the veteran fire power that other Metro teams have. The Hurricanes have a perfect opportunity to get some buzz by injecting younger players into the lineup and just letting them play. No one is picking the Hurricanes to win the cup this year, but they can compete using young legs on the ice night after night. Free agency was quiet and the team decided not to bring in a bunch of veteran journeyman to fill their lineup. Jay McClement has played the most NHL games out of all the forwards the team brought in. The 31 year-old forward has played in 682 games at the NHL level but has never been a guy that is going to add excitement to a team. The other forward the team signed was Brad Malone who has only played in 54 total NHL games in his career. I would rather see the team use some of the homegrown prospects in the lineup then taking a risk on players that didn’t help out on their past NHL teams. Guys like Zach Boychuk, Chris Terry and Victor Rask have put in time with the Hurricanes AHL team, and it is time for them to get their chance. Boychuk tore up the AHL last season. After playing a few games with the Penguins in 2012-2013, Boychuk came back to the Canes AHL team the Charlotte Checkers and put up 74 points, scoring an AHL high 36-goals. He deserves the chance to bring that spark to the Hurricanes on an NHL level this season. After the injury to Jordan Staal, I don’t think the Hurricanes have much to lose this season in playing younger players who have something to prove in the NHL. With a permanent spot on the roster and an extended amount of time playing with higher skilled line-mates Boychuk will flourish. Let the new coaching regime have their chance to get players like Boychuk build chemistry with some of main stays in the Hurricanes lineup. He will be able to put up the point totals that he has proven he can while playing in Charlotte. If you look back at his time in the AHL his point totals have gone up every season, and the extended time in the AHL will translate with more time at the NHL level. The first round pick is still battling for a spot on the NHL team this preseason. I am all for giving Fleury a few games early this season in the NHL, but ultimately he will be sent back to spend another season with his Juniors team. People will argue that players like Olli Maatta played a full NHL season his rookie year proving he was ready for the big leagues. The Hurricanes are in a different circumstance then the Penguins were last season. Even before the great play of Maatta last year the Penguins were a playoff lock, and have always had mild success in the playoffs. The Hurricanes are not in the same situation as the Penguins were going into last season. It is not the best time to inject a teenager into the Hurricanes defense. He needs to grow more physically and mentally before he can start to contribute successfully in the NHL. He might be able to come in this season and play an effective average second or third pairing on defense, but it is not a risk worth taking this season. The season hasn’t started yet and this is no time to get all negative on the team. Yeah Jordan Staal went down, and yeah there are tons of questions on which players will step up for the team. The Hurricanes have the perfect opportunity to see what some of the younger players on their team can do. They have gotten great play in recent seasons from players like Jeff Skinner, Justin Faulk, and Elias Lindholm. The Hurricanes are not down and out, and they have nothing to lose in letting AHL prospects start the season in the NHL. They can’t waste their time hoping some of the “more experienced” players get the chance they were already given with past teams. Let players like Boychuk, Rask, and Terry get the ball rolling this season, and see if they can start throwing up points like they did with the Charlotte Checkers.